The Research School of Earth Sciences at the Australian National University invites applications for Postdoctoral Fellow (Level A) or Research Fellow (Level B) in ocean-sea ice modelling. The Postdoctoral Fellow / Research Fellow is based in the Geophysical Fluid Dynamics (GFD) group to undertake research into the development and evaluation of global, high-resolution ocean and sea ice model configurations. The Postdoctoral/ Research Fellow is expected to liaise and collaborate with Consortium for Ocean-Sea Ice Modelling in Australia (COSIMA) partners to contribute the Australian research community through the research initiative of COSIMA consortium. A PhD in physical oceanography, climate science, geophysical fluid dynamics or other relevant field is required as well as demonstrated experience in the modelling the ocean circulation and/or the coupled ocean-sea ice system. Terms: Continuing (contingent funded) appointment of three (3) years. The appointment may be extended subject to the availability of funding. 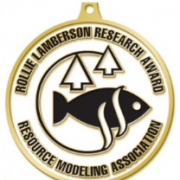 The Rollie Lamberson Award celebrates the contribution of Professor Rollie Lamberson to the field of natural resource modeling and the growth of the Resource Modeling Association by recognizing each year the most outstanding paper in natural resource modeling in the previous two years. See http://resourcemodeling.org/lamberson/ or below for more details. Only current RMA members are eligible for the award. All papers published in Natural Resource Modeling during the previous two calendar years (namely 2015-2016) will be considered automatically provided at least one of the authors is a current member. a nominating letter specifying why the paper is deserving of the Rollie Lamberson Award. Criteria below. 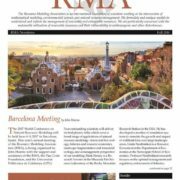 Send your nominations to RMA presidence or to RMA contact from the website. The submission for the award 2017 will be closed on January 20, 2017. 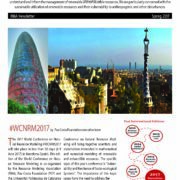 The Lamberson prize will be delivered to the winners during the 2017 RMA conference to be held in Barcelona on June 6-9, 2017.